The idea is to help thin-file customers — those who have less experience with credit — by incorporating signs of responsible financial behavior that traditionally aren’t seen by credit reporting bureaus. Boost also may help people who are rebuilding their credit after financial setbacks. Experian estimates the product could affect up to 100 million consumers’ scores. Consumers who want to use Boost must allow the product to scan their bank account transactions to identify utility and cell phone payments. Information about payments will appear in their Experian credit report and be used when certain credit scores are calculated from that data. Boost will count only positive payment history, Experian says, so missed utility or cell phone payments will not hurt your score. That’s different from how credit scores usually work, where late or missed payments are recorded in your credit report and can reduce your score. While this new alternative “credit” algorithm is not set to roll out until sometime in 2019, included below are my initial thoughts based on the BIAA press release and the below referenced articles from the Wall Street Journal, Consumer Affairs and USA Today. 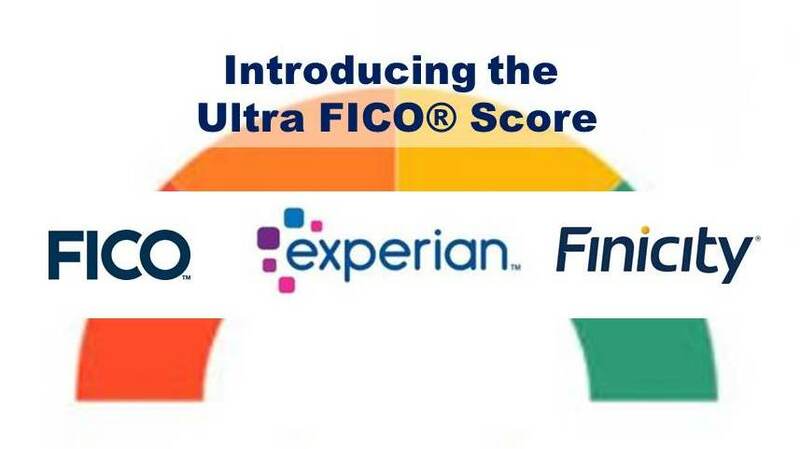 With Ultra FICO® Score, a consumer grants permission to contribute information from banking statements, including the length of time accounts have been open, frequency of activity, and evidence of saving, which can be electronically read by Finicity and combined with consumer credit information from Experian to provide an enhanced view of positive financial behavior. Experian, FICO and Finicity estimate this new score has the potential to improve credit access for the majority of Americans and is particularly relevant for those who fall in the grey area in terms of credit scores (scores in the upper 500s to lower 600s) or fall just below a lender’s score cut-off. Consumers who are relatively new to credit with limited history or those with previous financial distress that are getting back on their feet stand to benefit the most. This new system will roll out next year. Initially, the most likely use will be for beginner credit cards. The UltraFICO® is an add-on feature some lenders will offer to enhance a prospective borrowers credit profile and score. The prospect must provide access for a one-time snapshot of their banking/bill paying account. The data analyzed will be regular payments of rent and utilities. The expected average balance in the account should be $400 or more. There should be no overdrafts or NSF checks in recent months. It’s expected there will be more income than outgo to the account. Discussed is that the checking/bill paying account must be established for some undefined time. The above referenced WSJ article captures the essence of what the new credit score enhancing tool is expected to be. It will not, in the immediate future, be used by mortgage lenders. I expect that it may be used by some auto dealers. According to the Journal report, the new UltraFICO® would be a tool for consumers whose credit scores are not that great. If they have a few hundred dollars in the bank and have had the bank account for a number of [undisclosed] years without overdrawing they might see their credit standing rise. But in practice, the new formula is likely to be of greater benefit to consumers who already have high credit scores because they are the consumers most likely to have accumulated some cash in the bank. Consumers with low credit scores are often in that situation because they lack the extra cash to meet an unexpected expense. Based on practicality and experience, I believe this Consumer Affairs writer is off-base in his analysis of who this will help the most. Someone with >760 FICO® Scores has no need for a bump of a few points whereas someone with a 620 score most definitely has the need. We’ll soon figure out just how many months one must have $400 or more in their account to gain the bump. Consider the fact that neither FICO 8 or 9 are used in the mortgage lending industry. UltraFICO® may be used by certain credit card issuers as well as some vehicle lenders. We’ll know more next year. Debt settlement companies offer the promise of settling a consumer’s debt for a fraction of what they owe. The idea is simple: debt settlement companies offer to negotiate down the outstanding debt (usually from credit cards) owed to a more manageable amount so that a consumer can become debt free. Unfortunately debt settlement carries significant risks that may result in consumers becoming even worse off. Debt settlement is inherently a risky venture: in order to enroll into debt settlement programs, consumers are required to default on their debt which often results in fees, increased interest rates, and sometimes even lawsuits from creditors. Even after assuming all this risk, consumers are offered no guarantees; in fact, some creditors refuse to negotiate with debt settlement companies at all. Even if a settlement is reached, a consumer unable to keep up with the new settlement arrangement risks falling back into default – and now without the fees paid to the debt settlement company for negotiating the agreement. CRL finds that consumers must settle at least two-thirds of the debt they enroll in a debt settlement program to benefit, a result that many will not achieve. This chapter examines the debt settlement industry, the risks to consumers, and recommends actions at both the federal and state levels to reduce the potential harm to consumers. Debt settlement is a risky strategy for debt reduction – and often leaves consumers more financially vulnerable. Consumers must settle two-thirds of their debt to be better off than they were before – and many consumers are unlikely to reach that level of success. Strong state and federal laws could curb risks associated with debt settlement. This post is written specifically for those who’ve recently been granted a Discharge from a Chapter 7 Bankruptcy. Chapter 7 is type of bankruptcy where the debtor does not make periodic payments to a bankruptcy trustee for 3 to 5 years. The first step is to establish new credit in a strategic manner. Of course, you must also use your new credit in a responsible manner. In some cases, it is necessary to get your credit reports corrected to establish new credit. We’ll address both steps below. First, when establishing new credit. Ignore well-meaning advice to get a $300/500 secured credit card from just any bank that will open an account for you. Start with joining a credit union. With most credit unions, there are no fees. Also, there are no annual fees and no-cost to use many ATMs all over the USA. Take a moment and read my post on credit unions. In searching for the credit union (CU) to be the fit, do your homework. Call or stop in and ask about secured credit cards (this will lead you to someone that can answer or can get answers to your questions). Now that you have found your CU, open your Share (savings) account. Save $1,000.00 or more. Secure this savings against a Visa or MasterCard issued by your credit union. To build good and excellent credit scores, use no more than 20% of your credit limit. Ever. For example, on your $1,000.00 credit limit, never have more than $200.00 in use. For best results, payoff the balance monthly. Your higher credit scores get you rewarded with lower interest rates on home and auto loans, insurance, credit cards and better employment opportunities. Most credit unions will offer an unsecured card after you have established your good credit management practices for one-year. At this time, your savings securing your card will be released and another card issued. Your credit history will follow the new account. Next, open 2 or 3 lower limit credit card or other revolving accounts (department stores, Internet stores, gas cards, etc.). The key is to have 3 to 4 revolving accounts open and in use occasionally. Do know that credit is a use it or lose it commodity. On selecting the credit accounts, don’t bother applying to any creditors which were listed in your bankruptcy. Perform a Google Search such as this: “secured credit card + bankruptcy”. In your screening process, avoid those with an annual fee. After about 9-12 months of opening the accounts as above discussed and using them as above discussed, you should have actual lending scores (FICO® Scores) in the 700-720 range. These techniques have helped many clients over several decades. Not everyone will need to take step two. All should read the info in step two. In order to build new credit after bankruptcy, you may need to get corrections made to one or more of your three credit reports to reflect only accurate information. By accurate information what we mean is to make sure that all your bankrupted accounts reflect a zero-balance due. Understand that a bankruptcy discharge does not remove your previous credit history from your credit reports. Time does. Seven years from the date of last activity (last use or last payment), the account will be removed from your credit report. Keep in mind that the older a negative item on your credit report is the less it counts against your credit score. 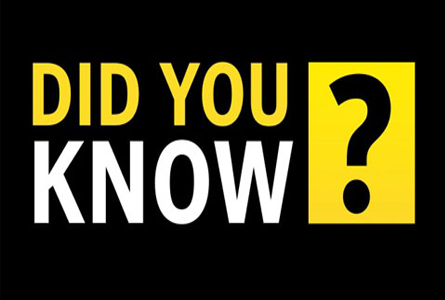 Also, the longer you have information reporting on your credit report, the better it counts for your credit history which results in a better credit score. As a rule of thumb, by the time the case is Discharged, several months following the filing of the bankruptcy case, most creditors will have reported the accounts as included in bankruptcy. In some instances, a creditor fails to update their record with the credit reporting agencies (CRA). So, in these instances, let’s talk about getting the incorrect items corrected. Often, the dispute process is neither quick or easy. Understand the CRAs are not your friends. Use caution with what you say or write to a CRA. For specifics on how to dispute information on your credit reports, I suggest you read my blog titled: Credit Repair/Dispute Basics. A word on entering comments to clarify some situation or another; such comments do not do anything positive for your credit scores or your credit history. It is of no benefit to you to make comments. Everything you say can and will be used against you. This is one of those times to consider the Miranda Warning along with the idiom less is more. When and only if necessary, you may address individual items as requested by your loan officer for an underwriter. Open or unresolved disputes on your credit report(s) can keep you from gaining credit approval. To begin correcting your reports, you need to get a copy of each of your credit reports. There are three credit reporting agencies: TransUnion, Equifax and Experian. You can get a copy of your three credit reports once a year for free via the Official Site authorized by Federal law: http://www.annualcreditreport.com. It does you no good to only review one or two reports. Review all three of them annually. For mortgage approval (purchase or refinance), two (2) years following your Discharge, you will be eligible to apply for an FHA, VA or Rural mortgage loan. Four (4) years following your Discharge, you will be eligible to apply for a conventional mortgage loan. Contact me below or via Quora with specific questions. Notice: The information on this blog is opinion and information. While I have made every effort to post and link accurate and complete information, I cannot guarantee it is correct. Please seek legal assistance to make certain your legal interpretation and decisions are correct for your situation. This information is not legal advice and is for guidance only. You may reproduce this information in whole and not in part, providing you give full attribution to James Spray. What Is A Purchase Reverse Mortgage? By way of background, a previous blog on reverse mortgages discusses the general facts regarding reverse mortgages. Let’s talk specifically about the purchase reverse mortgage, which is otherwise known as the Home Equity Conversion Mortgage (HECM) for purchase [H4P]. This product was created by the Housing and Economic Recovery Act of 2008 (HERA). The product is insured by the Federal Housing Administration (FHA) and guaranteed by the US Department of Housing and Urban Development (HUD). In short, the purchase reverse is a way to purchase a home with only a down payment. In addition to the down payment, the buyer is responsible for paying the homeowners insurance, property taxes and (if applicable) Home Owner Association (HOA) fees. There are no principal or interest payments required. However, one may make principal and interest payments by choice not necessity. Finally, if the loan balance on the reverse mortgage eventually exceeds the home’s value, the lender is insured against that loss. BORROWER: Age 62 and older based on the youngest titleholder. A non-borrowing spouse under the age of 62 may be added to the loan providing the spouse is over the age of 18. There is no credit required, nor a credit score requirement and only minimal income requirements. This is a minimum documentation loan. PROPERTY: Single family homes as well as 2-4-unit residential properties and all FHA approved condos are eligible. Title may be held as fee simple, a living trust, and leasehold or life estate. The property must meet FHA appraisal requirements. If the property does not meet FHA criteria (health and safety issues), a set aside account will be established for up to six months while the health and safety requirements of the FHA appraisal criteria are met. The property may be either an existing home or a new build home, so long as the property meets FHA standards. January 1, 2018 – Pricing is subject to change at any time. To illustrate – let’s look at the example of a $300,000.00 purchase at age 74: To purchase the residence, the HECM borrower would need $153,088 to close on the purchase of a $300,000.00 property. The balance of the proceeds is provided with the HECM as a benefit of the HECM program and include closing costs. In all examples of HECM purchase mortgages, no mortgage payments are required. All that must be paid out-of-pocket on an annual basis are real estate taxes, homeowners insurance and HOA fees (if applicable). There are no required payments of principal, interest, or other mortgage costs (including upfront costs) until termination of the HECM. Who Likes Reverse Mortgages The Best? The Borrowers Who Have One! A reverse mortgage for purchase allows older Americans to buy a house that better suits their needs without dumping all their retirement assets into it, which would be the case in an all-cash transaction. It also lets them avoid dipping into their monthly fixed income, which would occur if they took out a traditional mortgage. It provides more purchasing power and doesn’t drain all of the assets. It allows a buyer the luxury to get a better lot, to add all the upgrades they want and to still have no mortgage payment. The home is titled in the owner’s home; as with all mortgages, the lender retains a security interest in the title. There are no monthly mortgage payments. Instead, the loan is repaid when the home is sold or the borrower no longer resides in the home. The repayment to the lender includes the amount borrowed, plus accumulated interest. Any remaining equity belongs to the borrower, heirs or estate. The heirs may purchase the property for the balance due or 95% of the value, whichever is less. which threaten the health and safety of the homeowner and/or jeopardize the soundness and security of the property, must be completed by the seller prior to closing. (H4P FAQs per HUD). NOTICE: (1) Rates are subject to change without notice. For specific and current information contact me or your H4P Specialist. (2) The illustrations in the above chart titled: *Examples by Buyers Age and Purchase Price, are representative examples only. 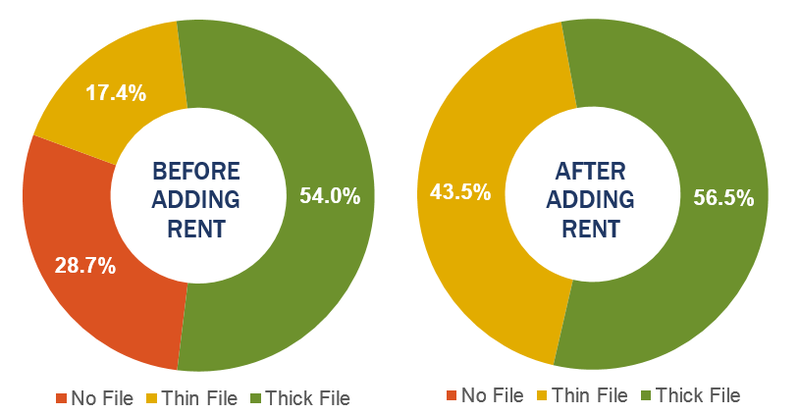 The figures are not intended to be anything other than representative illustrations in order to convey the concept of the purchase reverse mortgage. DISCLAIMER: This post does not represent that any of the information provided is approved by HUD or FHA or any US Government Agency. Experiencing a severe credit event such as foreclosure, short-sale, deed-in-lieu of foreclosure or bankruptcy does not mean you will never be eligible to get a home loan. 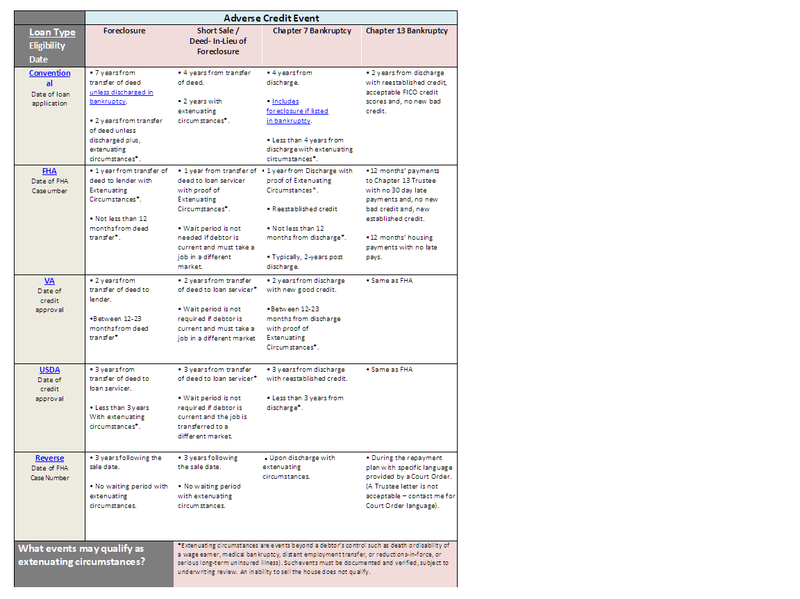 This chart provides the time-out periods required by event. The assumptions are that you have established acceptable credit scores and meet underwriting guidelines. In certain circumstances, one may qualify for a mortgage upon discharge of a Chapter 7 or during a Chapter 13. Financially Speaking™ James Spray RMLO, CNE, FICO Pro | CO LMO 100008715 | NMLS 257365 | Originally published in 2010 and updated regularly | September 19, 2017 Contact me to obtain a pdf copy of this chart. Kudos to Suzanne Woolley for authoring an article which accurately portrays how one can improve their credit.